This recipe requires a small amount of back story, but will be well worth it, I promise you! 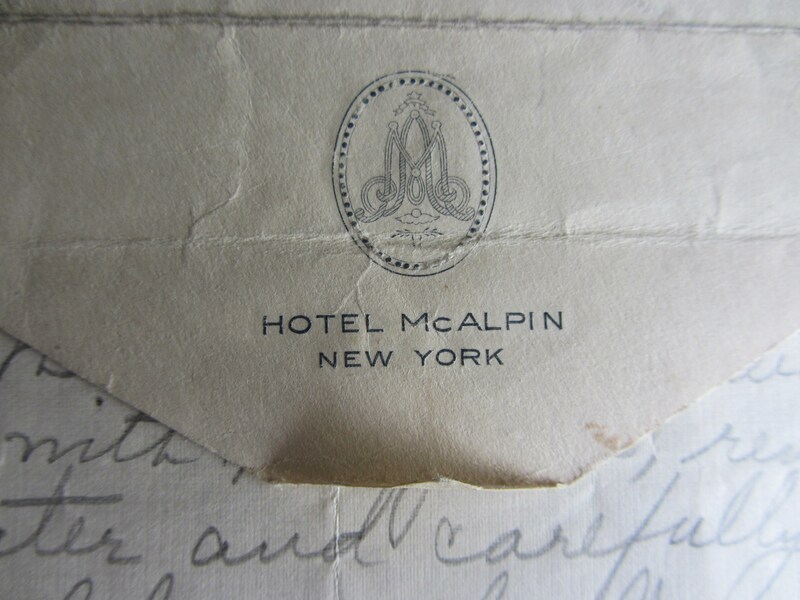 In the old family cookbook –For the full story on the book, go here— amidst other random bits of papers and miscellania, I found this envelope, marked with a crest. Naturally curious, I followed the paper trail, and discovered not only what might be the only surviving copy of the hotel’s Cream Puffs, but also fascinating details about the hotel and dessert. 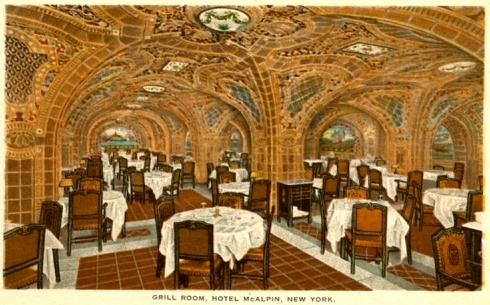 The Hotel McAlpin was built in 1912 on the corner of 34th and Broadway in Manhattan. At the time it opened, it was the largest hotel in the world, had a veritable fleet of staff that numbered more than half the total guests, and even boasted a Turkish Bath on the top floor. In the 1950s the hotel was lumped into the Sheraton hotel conglomerate, and in the 70s was converted to rentals. Today, sadly, it is full of condos, but in its prime was one of the striking hotels in NYC, housing guests during both World Wars and the 1939 World’s Fair. Of especial interest here, though, is what was served in said restaurant, including the hotel’s recipe for Cream Puffs. Written on a sliced-open envelope of hotel stationary, the recipe is loosely scrawled in pencil. Presumably, one of my more enterprising ancestors wheedled the recipe out of the hotel chef. As if it couldn’t get any cooler, I am keenly hoping that this cream puff recipe can be traced back to the period between the 1920s and the 1950s, when Champion Cream Puff Maker Forrest Glen worked there. As you can see from this photo, at over 7′ tall, Chef Glen was also rather tall. Perhaps the best part about this recipe is that it is so easy to make; in well under an hour, you can have a platter filled with these decadent Creme Puffs. The pâte à choux is straightforward process from beginning to end, resulting in tender, hollow little globes of pastry that are the ideal vessel for the filling. Very light, but sublimely rich, the filling is the star of this dessert. The smell of vanilla curls up from the mixing bowl, enticing one to dip a finger and taste. The secret knowledge of the decadent creme lying in wait within the pastry is a promise more than fulfilled with the first bite. The pastry gives way with little resistance as the filling shifts, always seeming to overflow its bounds in the least expected direction. A shockingly simple recipe, with stellar results, this one has made it to my permanent cookbook. Line a baking sheet with parchment paper, and preheat oven to 400F. Melt butter in boiling water on stove. Add cup of flour, stirring vigorously until the mixture has become a sort of thick paste. Transfer the dough to the bowl of a stand mixer (or a regular kitchen bowl, for use with hand mixer). Break the eggs one at a time into the dough while mixing, making sure each egg is fully incorporated before adding the next. The final batter should be smooth. Transfer the batter into a pastry bag or a ziploc with one corner cut off. Pipe the batter onto the parchment paper, making large blobs about the size of golf balls, set at least 1 1/2″ apart. You should get about 18 puffs total. Bake the puffs for about 20 minutes, or until they are a rich golden color. Mix heavy cream with the milk and beat until stiff. In a separate bowl, beat the egg white until it too is stiff. Add the sugar and vanilla to the beaten egg white, beat for a few more seconds to mix. Fold the stiff egg mixture into the whipped cream. Immediately transfer to a piping bag, or set to chill in the fridge. When the pastry puffs have cooled, the cream can be piped into them. Give each puff a good squeeze of the filling, but make sure you have enough to go around. You may also split the puffs and simply spoon the filling in, but I found that this made for messier eating, with more places for the filling to go. If you like, drizzle with a little chocolate. The finished Cream Puffs should be enjoyed shortly after making them, but can be chilled for a few hours. I love cream puffs! It looks like a monkey´s face! Incredibly fascinating story and yummy sounding recipe. Keep it up…you will likely unearth more interesting history!